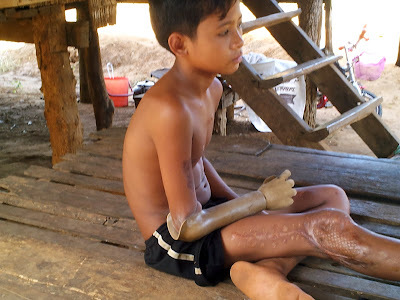 15 year old Thnot has learned to live with a prosthetic limb. 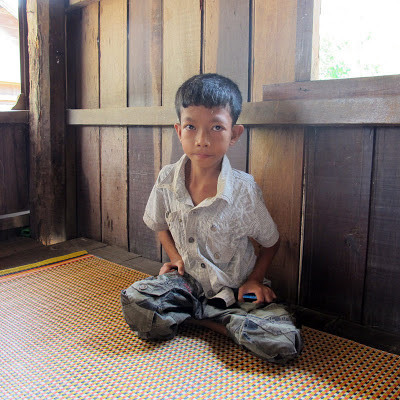 Sreng Chantrea, aged 13, is from the Lao ethnic minority community and he also has a physical disability. He speaks fluent Khmer and Lao and speaks a little English. Seng Chantrea at his home in Stung Treng village. “My name is Sreng Chantrea and I am 13 years old. I live Samaki commune in Stung Treng province. My home is made of wood and it has a zinc roof. I live with my father, grandma and sister. My father is called Leav and he is a journalist. My mother sells cassava in the market but lives and works in Ratanakiri province. My eldest brother died when he was only nine months old. He had the same condition as me. 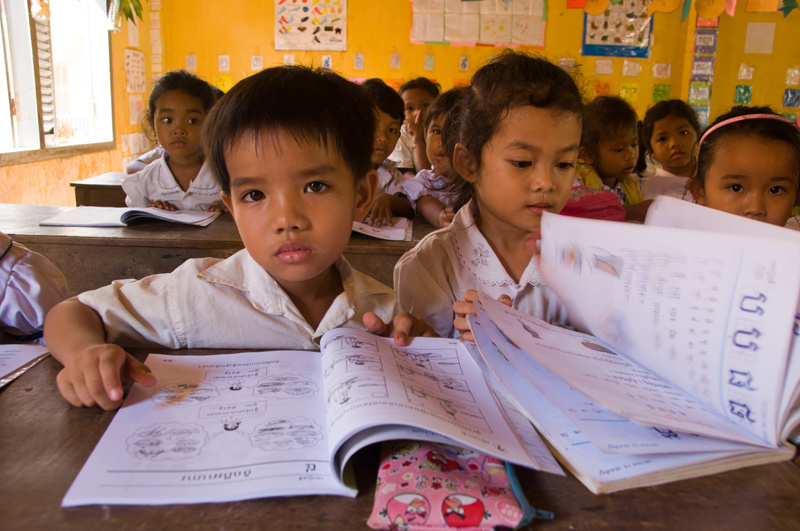 Srey Ma (left) in her classroom at Hang Khoban Primary School. It is Tuesday morning at Hang Khoban Primary School in Samaki Commune, Stung Treng Province, north-eastern Cambodia where classes are in full session. The wooden school is small with three classrooms and seven teachers, but for its 77 students, it is a child-friendly environment that welcomes children from all walks of life, including those with disabilities. 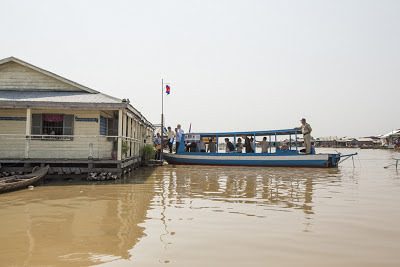 One of the boats to be used by District Education Officers to visit floating schools. It is baking hot in Boribor district, Kampong Chhnang province. On the Tonlé Sap Lake, the air smells of fish and petrol as the mid-day sun on the water creates an eye-dazzling reflection. The loud roar of boat engines is the sound of parents returning from fishing or going to market. As part of a global initiative, faith-based organizations in Cambodia recently came together to promote and protect the well-being of children. The Day of Prayer and Action for Children was organized by UNICEF, the Royal Government of Cambodia and the country's Buddhist Leadership. Faith communities have long been indispensable partners in UNICEF's work to advance children's rights. Religious leaders in Cambodia -- Buddhist, Muslim and Christian - are highly respected in their communities. They play an important role as agents of social change and can help to protect vulnerable children and their families. On the Day of Prayer and Action for Children religious leaders joined forces to promote and support family and community care for children and protect them from violence, exploitation and abuse, especially those most at risk. Complementary feeding campaign promotes nutritious porridge for children 6 - 24 months. In April 2012, UNICEF, with funding from Spain through the Millennium Development Goals Joint Programme and the United States Agency for International Development (USAID), and in partnership with the Royal Government of Cambodia Ministry of Health, National Centre for Health Promotion (NCHP), the National Nutrition Programme, the World Health Organization, the Reproductive and Child Health Alliance (RACHA), and Helen Keller International launched a communication campaign to promote complementary feeding in Cambodia to change the way caregivers feed their children in order to improve child nutrition. Muoy Kea’s grandmother combs her hair ready for school. 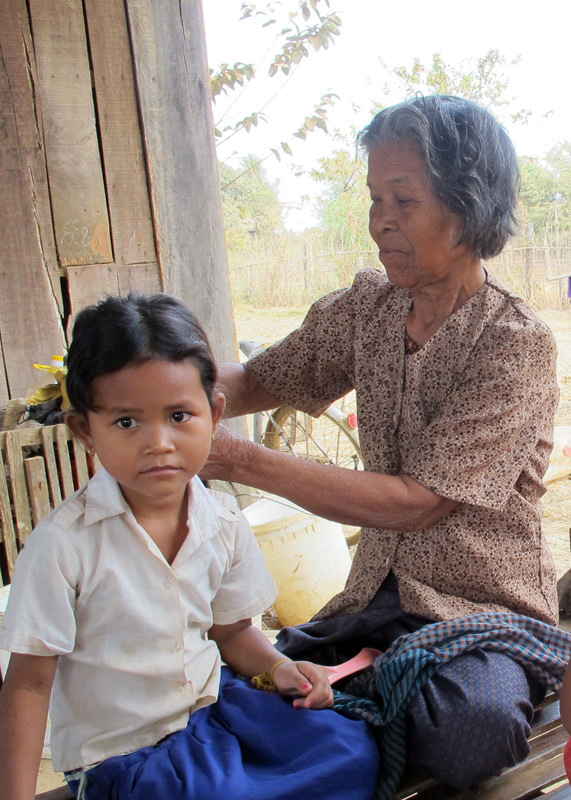 The parents of five-year-old Srin Muoy Kea are farmers with a meagre income, but they know the value of early childhood education and wanted to give their daughter the best chance to prepare for entry to primary school when she is six. So they sent her live with her grandparents three kilometres away in Chamkar Sleng village, Tang Kroch commune, where she attends the community preschool. Six year old Kim Houn lives in Kantreang commune in a rural area some 30 km from the tourist hub in Siem Reap city. He is in grade one at the state-run Tropeang Thnuol primary school in Prasat Bakong district, Siem Reap province.